It's time to bring out those egg cartons and toilet paper rolls! Do you have a pile of cardboard boxes saved for a rainy day? Do you collect cool recycled materials and then wonder what to do with them? 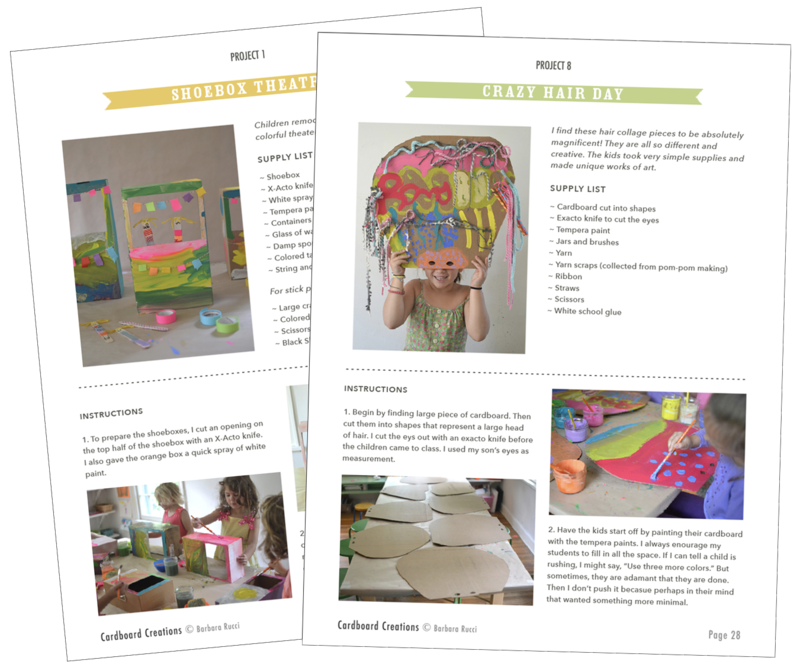 Do you want to inspire your children's creative exploration without spending a ton on art supplies? 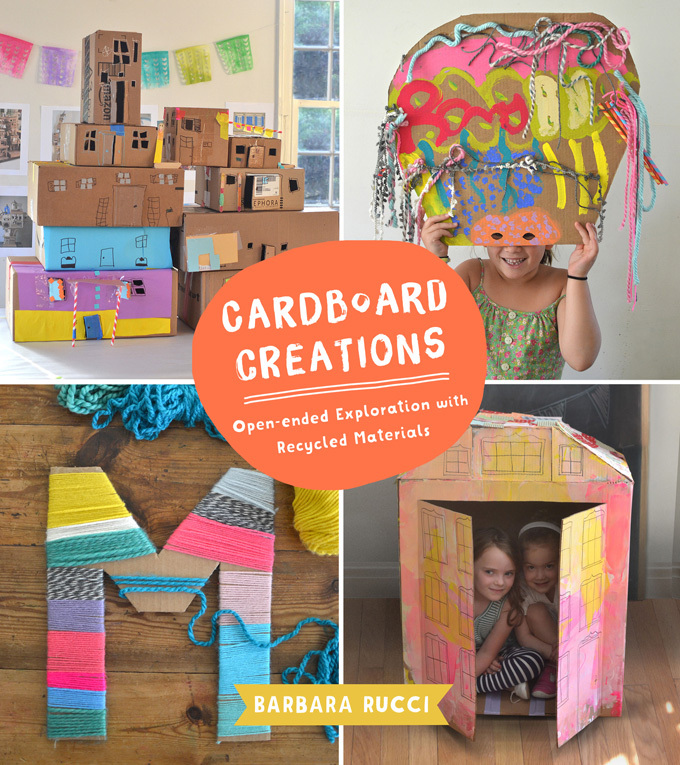 If you’re nodding yes, yes, and yes, then my NEW Book, Cardboard Creations is for you! Yes, I want all of these amazing ideas! You and I both know that art is really important in the life of a child. I mean, I’m an art teacher, and you’re here reading this page. So, we know. But until recently, there is something I actually didn’t know. Or hadn’t fully been aware of. It turns out that there is this thing called creative literacy, which is the understanding and ability to use the skills learned through creative process to make connections, solve problems, and communicate meaning. Skills like inventiveness, focus, perseverance, and collaboration. Wow! When my kids were little, I knew that the messy art room made them happy and helped them express their feelings, but I never realized that the skills they were learning then would give them such a huge advantage in the “real world”. It appears that heavily investing in your children’s creative literacy will likely give them a better chance at finding work and fulfillment in the future. Being resourceful and adaptable leads to discovery and innovation. As more and more of the things humans are good at are being outsourced to computers, robots, and even apps (think driverless Uber), artists are emerging on top. At a time when most of our abilities are becoming irrelevant (bye-bye skilled labor, hello 3D printer), creativity is our one remaining power that can’t be outsourced. Cardboard has never looked so good! In a world that's bombarded with boxes, this gorgeous book from Bar Rucci couldn't have come at a better time. For anyone with a soft spot for the environment, Cardboard Creations is brimming with process-driven art projects that will delight and educate children on how to become resourceful makers. Yes, help me build my child's creative literacy! There are so many goodies to discover inside the 58 pages of my new book! These are not “crafts”. Your child won’t get frustrated. 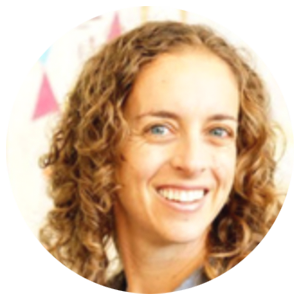 With open-ended projects, children will feel successful because there is no right or wrong. Just set out the supplies, and for the most part, let them explore. Cardboard is the predominant “free” material that we use, but projects also incorporate milk cartons, styrofoam, paper bags, cardboard tubes, shoe boxes, and lots of other things from around the house. Fill your art shelves with everything you need to do all 20 projects. Stock up on art supplies just once! There is nothing more frustrating than picking a project to make with the kids but not having the right supplies. I have made it easy for you with my printable master list of simple supplies, most of which you probably have already. 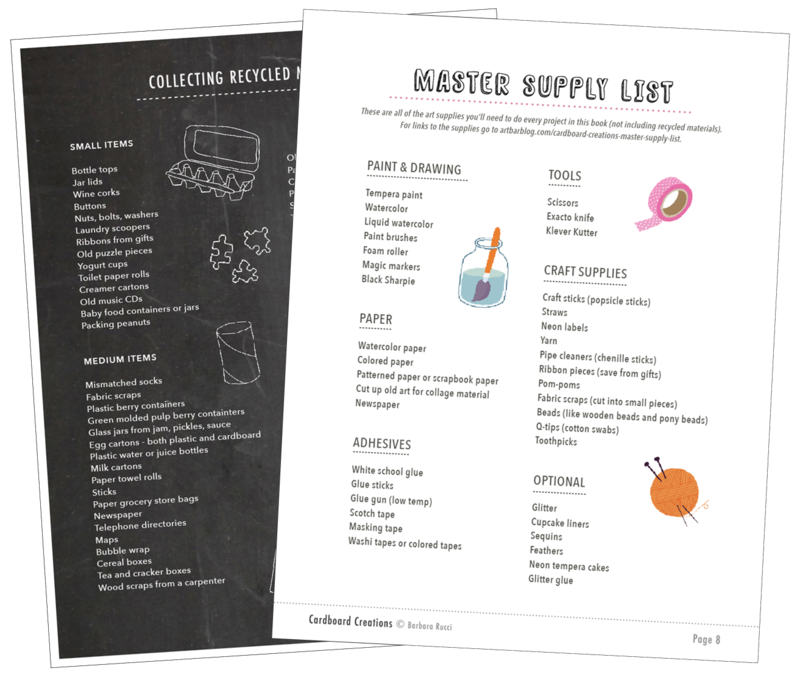 Also, find and collect the most interesting recyclables with my master list (also printable) and learn how best to store and display them in your home or classroom. Yes, I want these awesome materials! Make art accessible. It’s that easy. You don’t need to know about Cubism, or even be able to “draw a straight line” in order to surround your children with a creative life. Creativity is not about recognizing famous paintings or making something pretty, it’s about shaping and preparing young minds to use all of their senses and be open to every possibility that they can imagine. Giving your children a dedicated space, a shelf or two of supplies that are open and accessible, and the freedom to explore their ideas is all they need to spark their artistic process. Every once in a while, set up an art project for them so that they can build up their practical skill set - like using scissors, squeezing dots of glue, pulling off pieces of tape, stringing beads, learning the elements of the face, printmaking, still-life drawing. They will use these skills down the road when exploring their own ideas. By placing the utmost value in creative expression, we are not only giving our children the opportunity to slow down and use their imagination, we are also feeding their souls. And we are raising the inventors and entrepreneurs of the future. Bar shows us that it's not important whether your child makes a beautiful piece of art, it's their experience during the process of creating that really shapes and influences their young minds. My own kids grew up with creative freedom. And it shows. I get it. 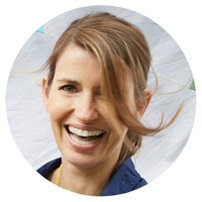 Setting up art projects for your children can be challenging. It takes time, it’s messy, the kids sometimes aren’t into it, and clean-up is no fun. Living a creative life is work. But let me share with you my greatest bit of older-mom wisdom: It really is all worth it. My children spent much of their childhood making as big of a mess as possible. Wherever they went, they’d wreak havoc. Piles of dress-up clothes, boxes of worms and dirt, makeshift forts using all the pillows, and always the art table covered with snips of paper, tape, paint, and glue. They would travel around the house creating elaborate games and make-believe worlds, using their imagination as a compass. Now that they are teenagers, I can see how that creative freedom of early childhood has helped shape the way they think and their outlook on life. They remain playful and flexible in their thinking, they collaborate well within a group (whether on the stage or on the ice), they are resilient and able to think on their feet, and most important of all, they always make me the most beautiful handmade cards. I’m not saying my kids are perfect. I only share this with you as encouragement to keep setting out those art supplies and letting your kids explore their imagination. If they practice thinking creatively, it will come naturally to them for a lifetime. And yes, creativity is messy. But it's worth it! Yes, I want to raise a future innovator! Hi! My name is Barbara Rucci, but people call me Bar. I started my blog, Art Bar, in 2012, as a journal for my children. 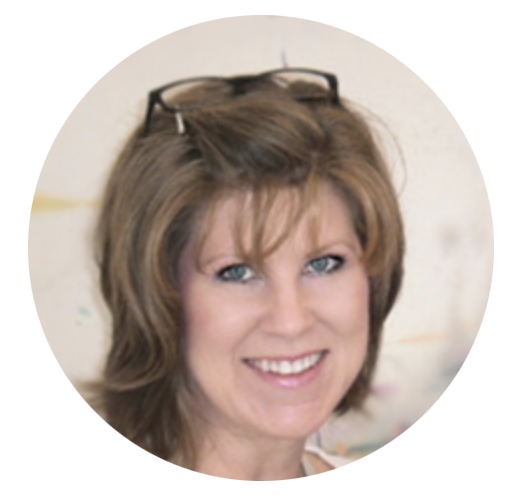 Today I have over 100,000 unique visitors each month, and my blog has grown into a place where I share my love of child-led art experiences with a community of parents, teachers, and fellow bloggers. My first book, Art Workshop for Children (Quarry 2016), has sold more than 10,000 copies worldwide and has been published in French, German, and Italian. My greatest joy is seeing projects from my book and blog being recreated in homes and classrooms across the globe. With over 35k followers on Instagram, I’m able to reach and inspire moms, dads, grandparents, and childhood educators from Singapore to the Bahamas. I’m a mother of three and live in Connecticut where the winters are long and the summers are hot, but it’s all worth it when October comes around and I spend the month watching the leaves turn the most exquisite colors, and taking walks to collect as many as I can for art class. You can find me on Instagram @artbarblog and on my new account @100daysofArtBar where I share simple daily art prompts for you and your child. Spark your child's imagination with Cardboard Creations! Order Cardboard Creations today so you can use all that stuff you've been collecting! Do you have questions about this product? Email me at hello@artbarstudio.com and I'll be happy to answer them!